TEAM Nigeria will arrive the country tomorrow morning after competing at the just concluded Gold Coast 2018 Commonwealth Games in Australia. According to the flight arrangement, the team which will fly in by Emirates Airline has been broken into two batches and will leave Gold Coast to Dubai in two separate flights. From Dubai they will fly one batch to Abuja while the second batch will land in Lagos. 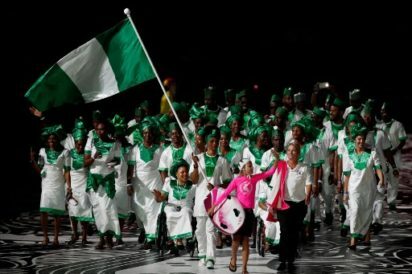 Team Nigeria placed placed 9th at the conclusion of events on Sunday with most of the gold medals won by physically challenged athletes. The Minister of Sports Barrister Solomon Dalung praised the effort of the team saying, they performed better than Nigeria’s previous outings. “We have done a thorough analysis of our outing in Gold Coast and found out that if you compare the size of the contingent to the Glasgow Games and what we paraded in Gold Coast one will know that this team performed better,” Dalung said. The post Team Nigeria return tomorrow appeared first on Vanguard News.